1. 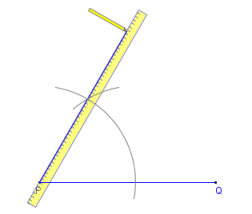 Draw a line segment which will become one side of the angle. (Skip this step if you are given this line.) The exact length is not important. Label it PQ. 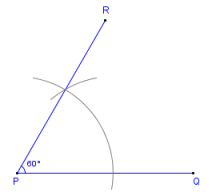 P will be the angle's vertex. 2. Set the compasses on P, and set its width to any convenient setting. 3. Draw an arc across PQ and up over above the point P.
4. Without changing the compasses' width, move the compasses to the point where the arc crosses PQ, and make an arc that crosses the first one. 5. Draw a line from P, through the intersection of the two arcs.